Humans are living longer than we ever have before. However, for most people, enjoying a high quality of life tends to be more important than living to the age of 100. Unfortunately, 80 percent of American seniors have at least one major health condition. It's no secret that functional limitations become more common as people get older. Seniors can support a future of good physical and mental health by following a regular exercise schedule and a nutrient-packed diet. Medical advice and healthcare resources play a key role in senior health. For example, preventive screenings, diagnostic tests, hearing aids, glasses, and prescription drugs can all vastly improve a senior's quality of life. Know how to get the most out of your Medicare coverage so you can take advantage of these critical services. Since basic Medicare doesn’t cover vision, dental, hearing, and prescriptions, you may need a Medicare Advantage plan for more comprehensive coverage. Check out websites such as MedicareAdvantage.com to determine which supplementary coverage plans are available in your state. While healthcare can help us feel better if we get sick, prevention is the best way to combat disease or disability. Not surprisingly, regular exercise and following a healthy diet are two of the best ways you can accomplish this. According to Time, too many older adults do not exercise on a regular basis. Studies have found that exercise both prevents disability and helps people recover more quickly from an injury. Engaging in regular physical activity can even reduce the amount of time you spend facing immobility and limited independence. While exercise provides numerous long-term health benefits, it's also a great pick-me-up if you're battling fatigue or a low mood during the day. One study found that a single bout of exercise leads to improved cognitive performance and increased positive emotions for people of any age. For the best mood-enhancing and stress-busting benefits, opt for cardio exercises such as brisk walking, jogging, bicycling, and swimming. Even low-intensity exercise has been found to improve the brain’s processing speed over the long term. For example, a round of golf will get you out in fresh air, and you’ll have to walk the course. Just make sure to consult a buying guide before purchasing clubs. Recent research reported by ScienceDaily reveals the importance of strength exercises for seniors. Strength training is essential for maintaining and improving muscle mass so you can enjoy greater independence and access more of the activities you love. Seniors can practice strength training using bodyweight and resistance bands until they feel comfortable adding weights. If you’re just starting out, try some of these strength exercises for seniors. A healthy diet plays an extremely important supporting role in any active lifestyle. If you’re making an effort to maintain your strength and mobility throughout your senior years, what you eat is just as important as which exercises you do. The amino acids in protein are key in muscle building, so try to incorporate protein into every meal. High-quality protein from meat, fish, dairy products, and soy provide the best muscle support. If you're a vegetarian or vegan, try to mix your plant-based protein sources to get all the important amino acids your body needs to stay strong. Aim for 30 grams of protein per meal. In addition to this, try to consume more omega-3 fatty acids — these reduce inflammation, supporting our health from head to toe while helping our bodies use protein more efficiently. While omega-3s can help improve mood disorders and stave off brain aging, sugar can be extremely detrimental to our mental health. High sugar consumption has been linked to depression, anxiety, and problems with learning and memory. So, try to reduce how much sugar you eat by seeking healthier alternatives. Quality of life is extremely dependent on our independence and ability to do the things we love. The best way to avoid disability and ensure you maintain a high level of mobility during your senior years is to prioritize exercise and healthy eating. When you do this, several other physical and mental health benefits will follow. Don’t accept declining health as an inevitable part of aging, but instead make it a point to strive for vitality every single day. Jason Lewis has been passionately helping seniors and senior caregivers in living a happy and healthy senior life. He has put up StrongWell.org to share information regarding senior fitness. Massage therapy can help loosen those fascial adhesions! You may know about the massage cupping I offer which is great for loosening adhesions and scar tissue, smoothing out the appearance of cellulite, assisting the lymphatic system... the list of benefits goes on. But did you know I also do massage cupping on the face? These special facial cups do not create enough suction to leave marks on the face, so no worries about that. This technique is great for sinus drainage, smoothing out wrinkles and giving a natural facelift. ​We can combine this with some cold stones on the face for an awesome treatment for allergies and sinus issues. Want to add this in to your session? Just let me know! I also wanted to let you know that I'm adjusting my availability for Fall by adding some occasional Saturdays and some Mondays to the schedule. In April, I spent a day in Detroit for a workshop on the DoTERRA Aromatouch technique. This technique is the clinical application of essential oils - 8 specific oils - to bring the body back into balance and is deeply relaxing. You can now add Aromatouch to any of the services at Bodywork By Design. Start your session out with 8 yummy oils applied to your spine and then flow right into your awesome massage! We start with a blend call Balance. Ingredients: Spruce, Rosewood, Frankincense, and Blue Tansy. dōTERRA Balance® essential oil blend creates a sense of calmness and well-being. Starting the AromaTouch with this oil creates a great initial bond between the giver and the receiver. Next we add in Lavender. The third oil added is Melaleuca. More commonly called “tea tree,” Melaleuca has 90 different compounds and limitless applications. Melaleuca is an essential part of the AromaTouch Technique for its cleansing effects. The On Guard blend is next. Ingredients: Wild Orange, Clove Bud, Cinnamon, Eucalyptus, and Rosemary. dōTERRA On Guard® offers fragrant and effective cleansing properties. Because of these properties, it is used in the AromaTouch Technique. Then a blend called Aromatouch. Ingredients: Basil, Grapefruit, Cypress, Marjoram, Peppermint, and Lavender. AromaTouch® essential oil blend combines the benefits of oils well known for calming and relaxing effects. The AromaTouch Blend is used in the AromaTouch Technique because of its soothing sensation. The Deep Blue blend is added next. Ingredients: Wintergreen, Camphor, Peppermint, Blue Tansy, German Chamomile, Helichrysm, and Osmanthus. Cold pressed from the peel, Wild Orange essential oil releases an energizing, citrusy aroma. We use Wild Orange in the AromaTouch Technique because of its ability to energize and revitalize. Peppermint, a well-loved oil, provides a myriad of health benefits. Peppermint essential oil is used in the AromaTouch Technique for its invigorating and energy-promoting qualities. This technique can be added into any service at Bodywork By Design and includes a $15 upcharge. Have I told you about my esthetician friend, Melissa, who owns GLOW downtown? (Located next to Malia Bistro). If you haven't experienced one of her facials, you are missing out! Melissa was telling me her interesting introduction to skin care as a client of Elina's in Kalamazoo after experiencing a reaction to other products. Elina's expertise and skin care line quickly cleared up Melissa's issue, and so she began her journey into the world of skin care with Elina's Organic Skin Care line. Melissa is now a licensed esthetician offering 75-90 minute facial services for $75 at GLOW. Each service includes a corrective herbal facial customized for your skin. Cleansing, steaming, vacuum and manual extractions followed by detoxing, exfoliation (acid, enzyme, and/or crystal free micro-diamond peeling), treatment (for acne, pigmentation, wrinkles / fine lines etc.) and nourishment. Compresses soaked in loose freshly brewed tea is detoxing and relaxing during your skin care service. Gemstones are not only a part of the skin care line, but also used for penetration of product and for a relaxing massage. A cold laser treatment is also performed for optimal firming and healing effect. Um... can you say Heaven?! Not only is it great for your skin, but oh-so-relaxing. I highly recommend you experience GLOW yourself, you deserve it! ​Call Melissa at (269) 245-1705 to schedule an appointment. Have I mentioned to you how much I love Spring? That moment when everything finally wakes up from Winter and starts to grow and bloom... it's my favorite. Gift certificates are available online, or in studio. If purchased in studio, it comes in a margarita glass because HOW FUN IS THAT?! Get a gift for your mother, or treat yo'self! I'm also excited to announce that last weekend I went to Detroit for a DoTERRA Aromatouch technique training. This new service is now available and will be a mainstay on the menu. It consists of the application of 8 beautiful essential oils to recharge and replenish you. It will be available as an add-on to any service (except ashi-thai stretching). You can select it with your service when scheduling online, or just let me know when you come in if you want to add it into your session that day for a $15 upcharge. It's that time of year again - Spring brings many tree branches down, weeds, and so much work to do in the yard! 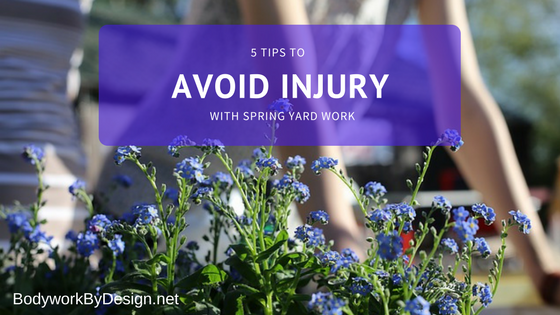 I often see clients with pain or injuries caused by overdoing it in the Spring with yard work. Go for a short walk or do some jumping jacks before you dive right in to bending over repeatedly to pick up those tree branches. Remember that the power comes from your legs and rear when lifting, keep your back straight and bend with your knees and hips. Don't try to do it all at once. Take frequent breaks to hydrate and stretch. Overworking yourself increases the likelihood of getting lax on your body mechanics and more prone to injuring yourself. Kneel on a rubber gardening mat, sit on a wheeled gardening stool, or sit directly on the ground instead of bending at the waist. Vary your gardening tasks each time. Do a little pruning work, raking, bending work, digging, etc. Don’t continuously perform any particular activity for a long period. And whether you overdo it or not, remember that massage therapy is an important part of taking care of yourself in every season!